When I tell people, “I am a Physical Therapy student,” there are two usual responses. The first is along the lines with thinking Physical Therapy is equivalent to a chiropractor or massage therapist (another blog for another day). But, the second is usually something about so-and-so got hurt from a sporting injury at one point in time or another and was eventually treated with therapy. However, Physical Therapy isn’t just treating the superstar athletes you see signing multi-million-dollar contracts on TV; it has a place in everyone’s life, even those with developmental disabilities and chronic conditions. Physical Therapists just help people move. Sounds pretty simple, right? Not exactly. Say for example, you have a 7-month-old child that has difficulty reaching for his favorite stuffed pig in front of him, regardless of how many times you give encouragement. Maybe you have a 2-year-old that fixates on stacking toy blocks and tunes out your questions asking whether she would like to go out for ice cream after dinner. Perhaps you have a 16-year-old who is perpetually late to class due to the poor set-up of his school hallways and short passing period times that don’t accommodate for his walker and slower walking speed. Or, maybe you have been wanting a new wheelchair after using your current one well-past its expiration date but are hoping to have insurance assist in the cost. All of these situations present an opportunity for a Physical Therapist to intervene, and it is important not to forget how beneficial Physical Therapy can be for a person with a developmental disability across the lifespan. The governing body of the Physical Therapy discipline, the American Physical Therapy Association (APTA), has multiple special interest groups within its body that are dedicated to improving the practice and quality of care given to individuals with chronic conditions and developmental disabilities within various settings. There are groups for children, teens and adults, Physical Therapy in the school system, and even for Early Intervention. In addition to providing information to professionals, these groups provide resources for individuals and their families such as social support groups or recommendations regarding difficult educational transition periods in a one’s life. 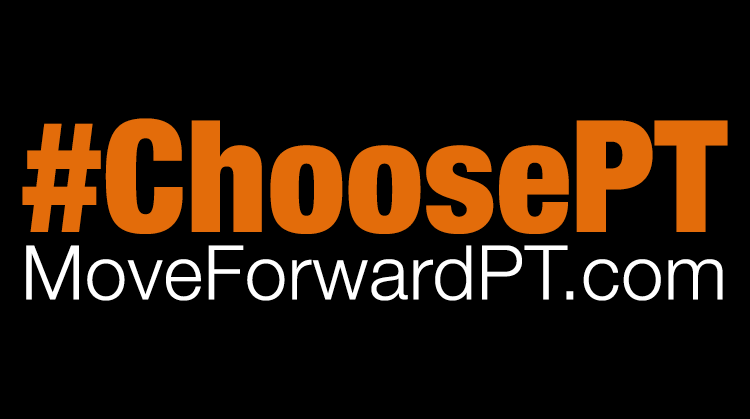 October is National Physical Therapy month, so if you see some orange flash across social media and a #ChoosePT picture here or there within the next few weeks, don’t just scroll right past without thinking what potential benefits Physical Therapy can provide to you and your family. You don’t need to just have a broken bone or a joint replacement surgery in order to have some benefit from Physical Therapy services; Physical Therapy can assist in improving quality of life in areas besides just physically navigating the surrounding area. A Physical Therapist can be another player on the care team and with the collaboration of others, help you live to the best quality possible.